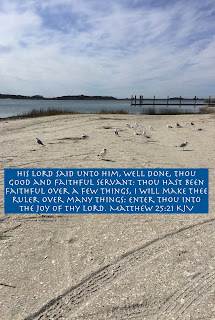 My Strength: Matthew 25:21 - "Well Done"
Matthew 25:21 - "Well Done"
The parable of the talents is about how God blessed people with great amounts of money to care for. In life, God gives us things to care for and sees how we will handle them. He wants to see if we will listen to Him and follow the direction He gives or if we will go our own way. His desire is for us to not do as we think is the way to do something but instead to do it His way even when it does not make sense. I truly believe the only way we will hear the words of being a faithful servant is to be living in His presence, sold-out to His will. I know there are many believers who do not believe this. They believe salvation is enough. I disagree with them. Being sanctified, set apart holy is the way to eternal life. I praise God for every day He leads me down the path of a holy life. I praise Him for being who He is to me. I praise Him for loving me enough to guide my words, actions, and attitude when I allow Him. I praise Him for giving me the desire of His heart as mine. I pray daily to be cleansed so He can fill me with more of Him. Why? Because I want to hear the words, "Well done, thou good and faithful servant..."
Thank You for Your love, mercy, and grace. Thank You for loving me so greatly. Thank You for giving me the desires of Your heart. Thank You for cleansing me so You can fill me. Thank You for being who You are in my life. Lord, I pray for a walk of holiness today. I pray You will be my words, actions, and attitude throughout this day. I pray for a change in my attitude when needed. Go before me and open doors of opportunity for me to be You. I also pray doors will be closed that need closed. I pray when the enemy comes knocking, You will empower me to knock Him down. Lord, be with Jeremy's family as they continue to grieve his loss from this earth. May they have the desire in their heart to live more like Jeremy did so they will hear these words too. Thank You Jesus for being My Master! Amen. Matthew 21:22 - "Great Is Thy Faithfulness"
II Timothy 1:7 - "Forever On Your Side"
I Peter 1:3-9 - "Chain Breaker"
Hebrews 6:19 - "My Life Is In You Lord"
James 1:2-4 - "Praise You In This Storm"
Psalm 100 - "Ever Be"
Jeremiah 29:11-14 - "Hills and Valleys"
Psalm 42 - "As The Deer"
Psalm 89:11-18 - "O Lord"
Romans 12:1-2 - "From The Inside Out"
I John 4:18 - "Stand In Your Love"
Matthew 22 - "Nobody Loves Me Like You Do"
John 8 - "Who You Say I Am"
II Timothy 2 - "Still"